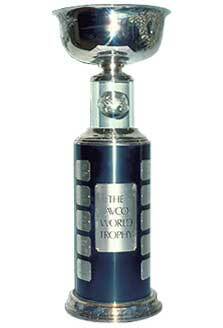 The AVCO World Trophy was given yearly to the championship team of the World Hockey Association (WHA). The trophy was donated to the new league in 1972 along with approximately $500,000 by the AVCO Financial Services Corporation. Thus the WHA became the only major sports league to have its championship trophy bear the name of a private corporation. There actually exist three AVCO trophies. Besides the one that is on display at the Hockey Hall of Fame, the others reside in Nova Scotia and Winnipeg. The Avco Trophy was retired after the WHA ceased operations in 1979. The Bobby Hull led Jets claimed the trophy on three ocassions while Gordie Howe and the Aeros won it twice.